It’s 2 weeks to Christmas and you’ve been exercising for 10 weeks if you’ve been following our 12 weeks to Christmas countdown. You should have noticed your pelvic floor muscles getting stronger, and maybe you’ve waved goodbye to those embarrassing leaks or maybe your intimate sensation has improved. Don’t forget though, there’s still more you can do to help your pelvic floor. If you really want to increase the strength of your workout, try using one of our fantastic gold probes. We recommend the Perisize Probe – we’ve called this the Super Probe in our offices. Instead of plugging into one channel of your Kegel8, it plugs into both, and effectively doubles the strength of your workout! Even if your muscles are strong and have got used to the strength of your normal probe, you will really notice a difference if you try the Perisize. A good-quality Vitamin D3 supplement has been clinically proven to help your pelvic floor. A recent clinical study showed that women who were deficient in Vitamin D were much more likely to suffer from pelvic floor weakness. At Kegel8, we have a high-quality Vitamin D supplement available at the perfect dose for your pelvic floor. You can see the clinical evidence in our blog here. The most important piece of advice we give to all of our Kegel8 ladies (and men too) is to carry on exercising. 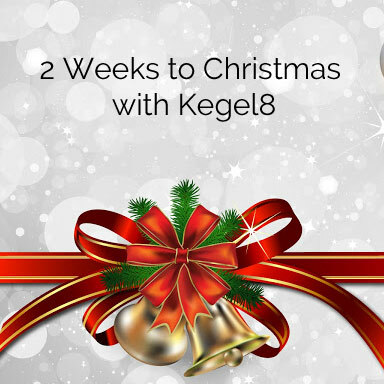 It’s tempting to stop exercising once you have achieved your desired results, but what we tell all of our Kegel8 users is that the pelvic floor muscles are like any other muscle, and if you stop exercising them, they will get weaker again. Exercising just twice a week once you have achieved your desired results is enough to keep your muscles strong and healthy for years to come. 2 weeks to Christmas, you’re nearly there!